Yogurt smoothies and shakes serve triple duty in our house: they offer something a little different for busy morning breakfasts, they pack in healthy proteins and enzymes, and they give me a quick and easy opportunity to use up fresh fruits, like bananas or oranges, which have passed their prime. As with a lot of my recipes—yogurt smoothie ingredients are totally interchangeable depending on the ingredients on hand. 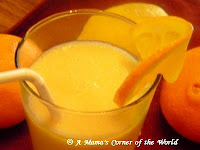 We are using our Lemon Citrus Yogurt Breakfast Shake for our Y entry in our kitchen friendly Blogging from A to ZChallenge. Y is for Yogurt. In a large capacity blender, combine all ingredients except ice cubes and blend until well combined and smooth. Add the ice cubes, one at time, blending completely between each ice addition. Pour into serving cups and garnish as desired. We simply used an orange twist—but, have also added mint leaves or maraschino cherries as well. Serve immediately. Disclaimer: I am a member of the Yoplait Light Swap Team and occasionally receive complimentary yogurt and promotional items for use in our recipes. If you would like to learn more about Yoplait Light and other #Swapportunities visit the Yoplait Light Facebook Page for recipes, healthy ideas, fashion tips and more.